Call us at 618-985-5234 for complete details on any of our internet or TV plans. Out with the old (Gen4) HughesNet and in with the new (Gen5) HughesNet. The new HughesNet Gen5 service for 2018 is the result of HughesNet launching its EchoStar XIX satellite. HughesNet says the EchoStar XIX is the “world’s highest-capacity broadband satellite,”1 which seems worth bragging about, but we care only because it means better satellite internet plans for us. HughesNet plans make so much more sense than before (Gen5 plans compared to Gen4 plans), and we love it. For example, the same four HughesNet plans are now available across the entire United States. 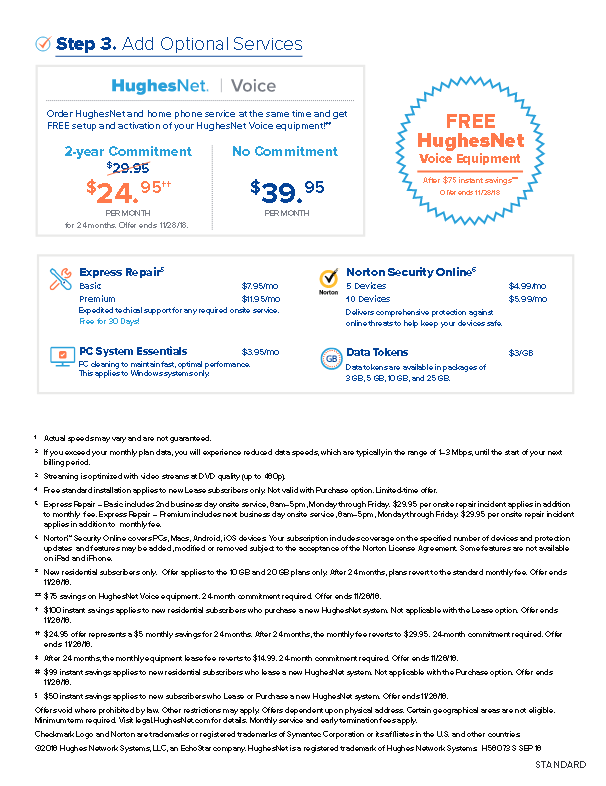 The hassle of trying to figure what HughesNet plans are available where you live is no more. You used to get different plans and prices for different ZIP codes! Now HughesNet has four plans, four prices, and one set of speeds (25 Mbps download, 3 Mbps upload). It’s that simple—all internet providers should make choosing a plan this easy. ...less competition means higher prices all around. As happy as we are that HughesNet simplified its plans, we’re still not hot on the prices. We can’t blame people for balking at 10 GB for $49.99 per month, but that’s the nature of the beast: satellite internet was made for those without access to other types of internet (cable, DSL, etc. )—and it’s an expensive technology. Until more people decide to launch satellites into space, we’re stuck with a lack of competition in the satellite internet market. So, as it goes, less competition means higher prices all around. 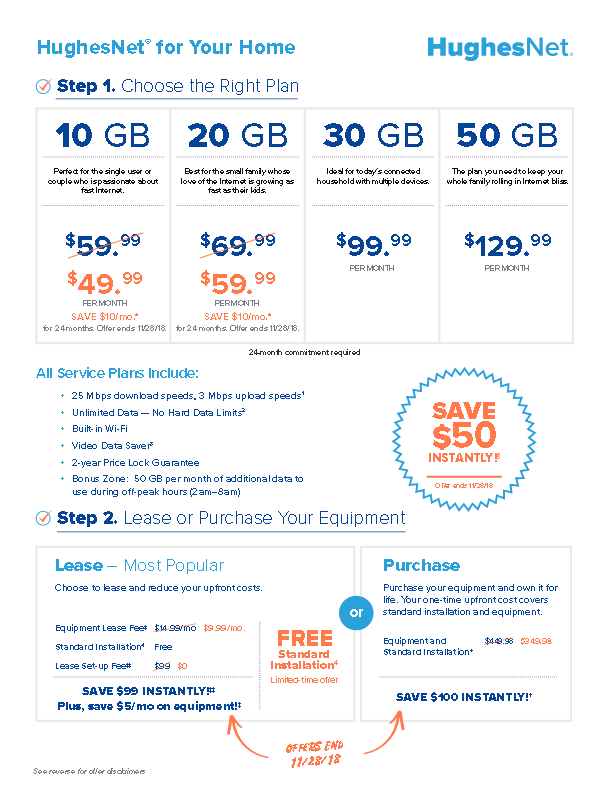 The 20 GB plan has enough data for most people, and they commonly run promotions for new customers. We’ve heard from plenty of customers who complain satellite internet is so much more expensive (and slower) than other internet service providers (ISPs), and we’re not making excuses for HughesNet pricing. But here’s what we say: satellite internet is for those with no other choice but dial-up internet service. Don’t get satellite internet if you can get DSL, cable, or fiber internet service. You’ve been warned. HughesNet doesn’t stand a chance against those types of ISPs, and its prices are about what you’d expect for satellite internet. If you compare Hughes Net's Prices to other satellite internet providers, you won’t find much of a difference. HughesNet’s biggest competitor, Viasat (formerly Exede), has a similar price range: $50–$150 per month, compared to HughesNet’s $49–$129 per month. If you’re looking to save a few bucks, the monthly service price may not be the biggest differentiator. However, equipment and associated fees may be something to consider. Like every internet provider, HughesNet can improve on its customer service and satisfaction. It provides installation services through third-party installers. So you never know what kind of service you’ll get when someone comes to install your satellite internet dish or when you call customer support. To be fair, we didn’t experience any issues with customer service—but that doesn’t mean you won’t. To help set expectations for satellite internet service, we recommend checking out the “What to Know Before You Buy” section in our Best Satellite review. HughesNet made the smart move to include the same bonus features and standardize speeds in all its plans, so it’s a little harder for us to come up with a solid recommendation. Still, we think the 20gb plan will work best for most customers. It has a good amount of data. We love helping out with questions. If you’re trying to find a workaround for watching Netflix or wondering how much data you need to jam out to Spotify, ask us in the comments section below. Have a complaint? Make it count and tell the FCC. We’ve heard some brutal customer service stories, but all we can do at Reviews.org is try to make our information better. If you really want to make your voice count, tell the FCC. The FCC’s Consumer Complaint Center lets you easily leave a complaint or share your experience. Who knows–your words to the FCC could make a difference by demanding more from service providers.